The Goods and Service Tax is all set to be implemented from the 1st of July and is considered as one of the most revolutionary reforms in India. It is a comprehensive and single indirect tax on goods and services across India. This reform, when it comes to play, can have a profound effect on all sectors. The real estate sector, in particular, is considered to be one of the biggest beneficiary of this reform. 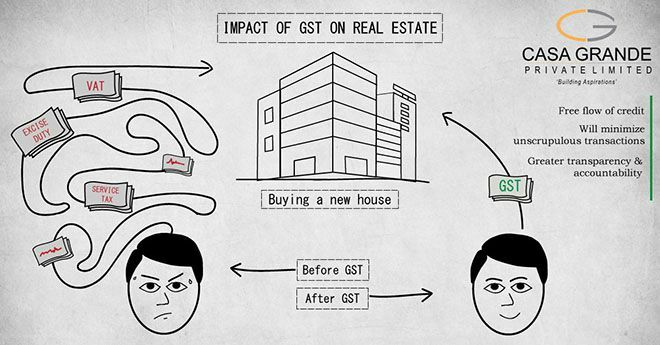 Read on to get a closer insight into the impact of GST on the real estate sector. You can check out our home buyer’s guide to taxes and duties payable while buying a home for a detailed understanding. All of the above taxes, with alternating jurisdictions between the state and central government, can create a good amount of confusion and redundant taxation. This has had an adverse impact on the real estate sector. With the GST being implemented; the process of compliance and implementation of taxes is all set to become transparent and more efficient. During the development phase of a project, there are various kinds of expenses which are incurred by the developer, such as – CST, service tax, customs duties, excise duties, etc. GST is expected to have a huge bearing on the materials procured for the construction of a project, which in turn will have a direct impact on the total cost of construction. The overall outlook though is positive. Tax on steel and cement are expected to go down resulting in higher margins for real estate investors. Price competitiveness is increasingly becoming a necessity in the highly competitive real estate market. If investors can appropriately manage this aspect of real estate, then they will very easily be able to make a profit. The clustered approach of one indirect tax in the form of GST has a huge impact on residential real estate. Primarily, the VAT charges applied on under-construction projects vary from state to state, creating an uneven tax structure across the nation. Apart from VAT charges, basic construction costs such as cement, paints and varnishes are also decided by the individual state governments. Post GST, all these charges will be addressed under the single indirect tax of GST, eliminating the variation in real-estate costs from state to state. Additionally, the overall tax paid by a consumer varies between 25 to 30% based on the state they are investing in. Post GST implementation, the combined tax to be paid plummets down to a meagre 12% throughout India, giving the investor the ultimate advantage of a reduced and uniform tax structure. The current existing channel of tax payment has numerous issues such as double taxation, indirect taxes and non-uniformity in taxes due to state government determined VAT rates. GST will now free up consumers from paying a number of taxes at different levels and thereby make the process much more streamlined. This will effectively encourage NRIs to invest more in Indian Realty. Through the formation of a simple, transparent and all-inclusive channel, it bodes well for foreign investments. It reduces the various mandatory documents NRIs need while investing in Indian realty. It also increases the trust level of NRIs and encourages them to confide in investing in the Indian real estate sector. There are also a multitude of home financing options for NRI investors to keep them intrigued in the Indian real estate scenario. In summation, buying your dream home will now be easier and have more benefits, both for the buyer as well as the seller. Apart from GST, you can also consider getting familiar with the RERA bill and the Budget Impact on Real Estate to get a clear understanding of the newly introduced reforms. Visit Casagrand today and invest in your dreamhome.